Heat some peanut (or olive) oil in a skillet - you want it pretty hot! 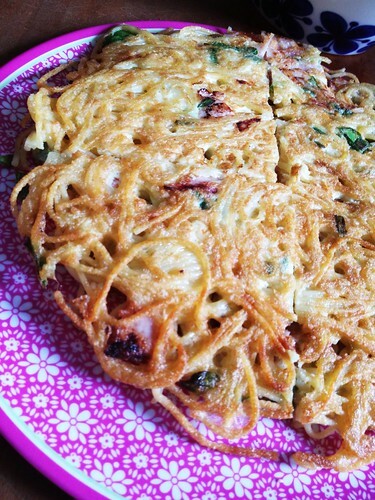 Mix up the eggs, ham and scallions. Add in the spaghetti and mix well - using your hand works very well. Pour it into the hot skillet, and fry for three minutes on each side on medium-high heat. Cut into wedges - triangles- and serve. Season if you want to, but mine was plenty salty from the ham. I bet sriracha would be good with this, for those seeking a spicy kick. This is a great idea. The crunchy edges on baked pasta are always the best bits, so I'm sure this would be delicious. I am going to make extra pasta for dinner tomorrow to give me an excuse to try it. Thank you!